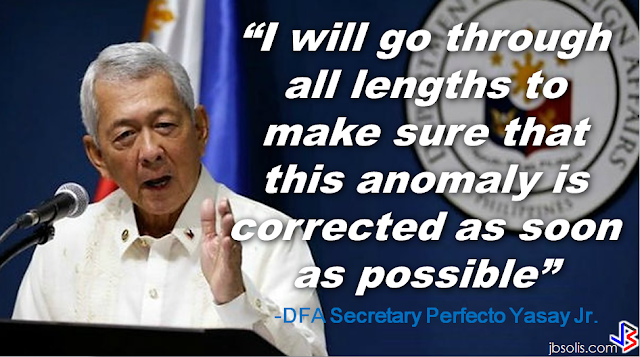 Foreign Affairs Secretary Perfecto Yasay Jr, vowed to pursue the alleged passport printing anomaly and bring it immediately to President Duterte's attention for appropriate action. 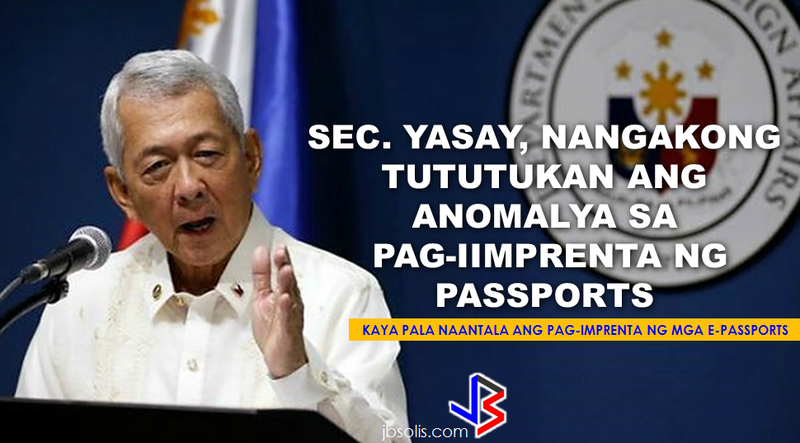 “During the previous administration, the printing of our e-passports was transferred from the BSP to a government controlled agency known as APO that did not have the capability, the equipment or expertise to print this passport,” Yasay said. This clearly explain why the e-passports are taking a very unreasonable time to be printed. They gave the job to the wrong people. The Secretary said that he had attempted to stop the anomaly by urging the Bangko Sentral Ng Pilipinas (BSP) to take the job back but, to his surprise, the BSP refused to do so. Last year, a graft case has been filed by the Anti-Trapo Movement (ATM), an anti corruption watchdog, against the two former DFA Secretaries Alberto Romulo and Albert del Rosario, together with other DFA and BSP personnels who served under the two previous administrations. 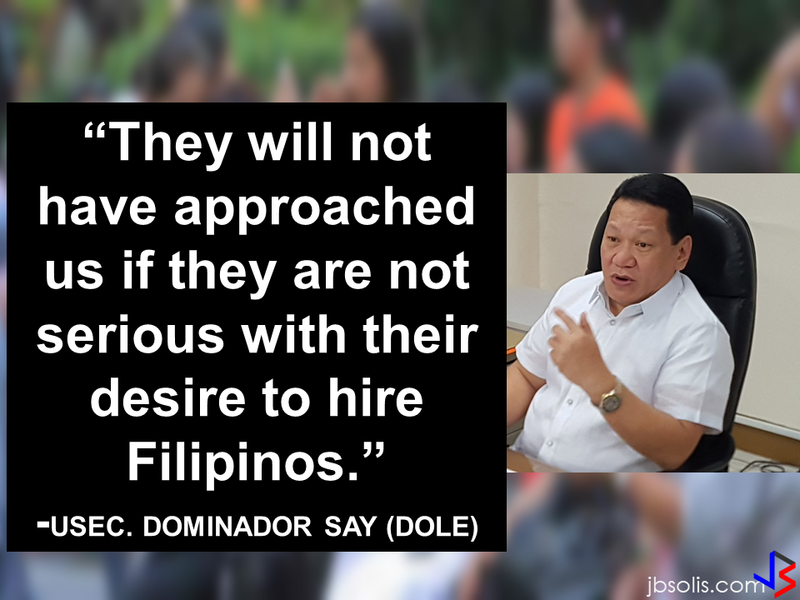 Romulo was Foreign Affairs Secretary from August 2005 to February 2011 while Del Rosario held the post from February 2011 to March 2016. 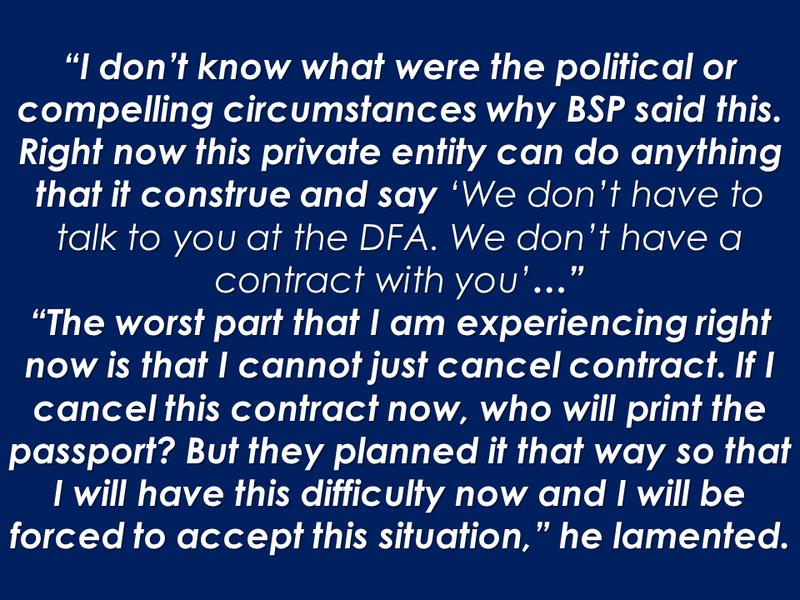 The group said that the supposed e-passport production anomalies continued under former DFA Secretary del Rosario, awarding the negotiated contract to APO Production Unit, which has no track record on printing security documents such as the Philippine Passport, and said to be using an outdated and cheap printing equipments. Yasay said he already informed President Duterte about the matter--his plans and actions. “First and foremost, I would like that private entity to be liable to us. Once an agreement is signed to this effect, then I can sit down with them and deal with these specific problems that we are now facing and if it cannot be fixed at least I have a recourse against them,” he said.